Yomi Ladapo was born on August 15, 1957 in Ibadan, Oyo State. He is an indigene of Oyo State. He is married and blessed with Children. Yomi Ladapoe obtained a Bachelor of Science degree(B.Sc) in Sociology from University of Ibadan, 1983 and and a Masters in Public Administration from Lagos State University in 1999. He had his compulsory One year National Youth Service at Abeokuta, in Ogun State. 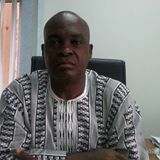 He was appointed into the Federal Civil Service employment on January 14, 1985 as Administrative Officer . His first posting was the then Cabinet office (now SGF office) in Lagos where he spent seventeen (17) years with Political Affairs department before being posted to the Ministry of Defence, Science and Technology, Mines and Steel Development and Finance. He is on his second deployment to the Ministry of Defence and presently serves as Director Reform Coordination.